Ethics, or lack thereof, has been the raging catchphrase in Donegal recently with county councilor John O’Donnell caught on RTE camera allegedly offering lobbying services for cash and Bunbeg-based, EU-funded former school principal, Finbarr Boyle, stealing more than 200,000 euro from a village school, including money earmarked for childrens’ food. But what’s all the commotion about? Hasn’t there been such unsavory goings-on right here in Donegal for years? Why the shock? Or is there any, really? In last weekend’s edition of ‘The Irish Times,’ columnist Fintan O’Toole, painted a scary scenario, a malaise spreading nationwide. As a journalist and editor for over thirty years, I thought sharpened instincts had made me a good judge of character – boy, was I ever wrong. Sitting at a lunch prepared by my wife in my home with Mr. Boyle as guest some time ago, I would never have guessed the man across from me would stoop to such lows as using a village school’s money where he was principal to treat himself royally to holidays in England, Spain and other fine places, car and house payments and expensive golf equipment. 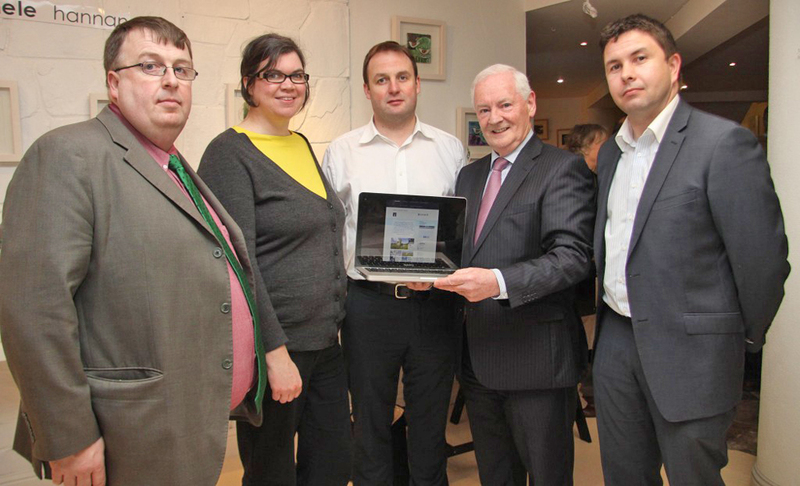 (l to r): Concubhar Ó LIatháin, CeangalG Marketing Manager, Claire Nic Neacail, Alasdair Morrison CeangalG Director, Dinny McGinley Fine Gael TD and Fionbar Ó Baoill – CeangalG Training Manager. 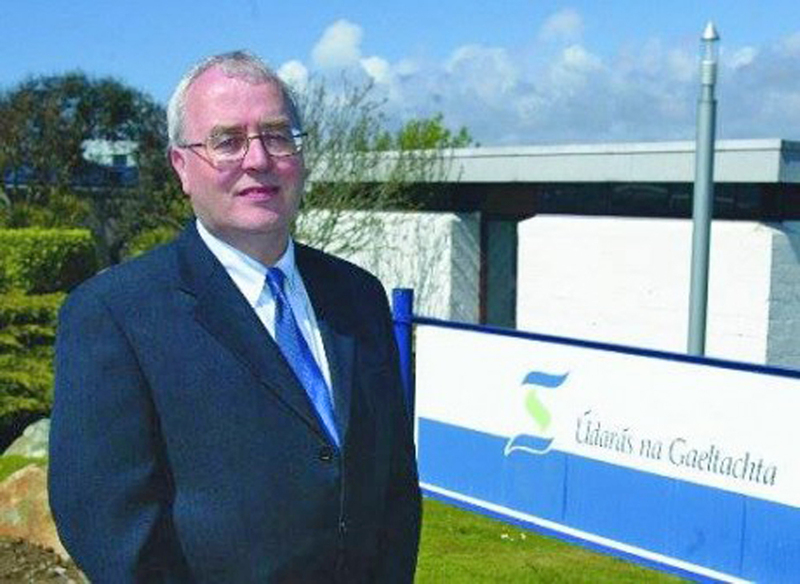 Mr. Boyle was given space inside the headquarters of Údarás na Gaeltachta in the Gweedore Industrial Estate, Bunbeg as a training manager – surprising, as that particular organisation has refused to gave any free space to small, local entrepreneurs in that same estate, a situation local Sinn Fein TD Pearse Doherty, has consistently taken issue with. I must admit, Mr. Boyle impressed me then, a fast talker, assertive and supremely confident. Yes, I know what you’re probably thinking – ‘Sounds like a conman to me.’ As things turned out, you are absolutely right. But I was left sad and disillusioned after learning of his multiple theft. He struck me then as the kind of person who could be a positive force for change, especially as we discussed the importance of ethics and the need for the Donegal Gaeltacht to rid itself of its historic cronyism and nepotism which have warped normal economic development of the region. Yet this is the same person found guilty of seven counts of theft over a number of years (he admitted to many more as part of his plea bargain), for whom Judge John Aymler may not impose a custodial sentence because, in part, 25,000 euro of the money taken may be paid back within a year. That’s around a tenth of what was stolen. Who says crime doesn’t pay? When contacted by me this week on the issue, Dr D. Munro, chair of the CeangalG Steering Group, Sabhal Mor Ostaig in Scotland, e-mailed back, saying, “Mr. Boyle’s actual contract of employment, for the post of Training Officer, with the wider CeangalG Project, was formally and directly managed through our Project Partners, Údarás na Gaeltachta.” He added that Mr. Boyle was “employed by the project between 9th Sept 2013 and 31st March 2015.” The Gardai investigation began as late as 2008 and Mr. Boyle, according to media reports, admitted his thefts almost two years ago (January last year). Mr. Munro added, “At no stage in either the recruitment process or during his subsequent period of employment, was CeangalG ever made aware of there being any on-going police investigation.” Mr. Munro cc his email to the law company of Wright, Johnston & Mackenzie and to the University of the Highlands. Have I touched a red button? As for independent councilor John O’Donnell, the ball is largely in his court. He can do the dignified thing and bow out. If he stays, he places the entire council under a shadow. Independent councillor Frank McBrearty says he should be removed from all committees. But it seems resigning is the last thing O’Donnell will do. Another Independent councillor, Micheál Cholm Mac Giolla Easbuic, is right in asking fellow councilors to walk out of the chamber at the next meeting in protest. Someone has to stand up, otherwise – due to blatant impunity – it will get much worse. Let’s see if that happens. If not, then Fintan O’Toole’s words ring frighteningly true. 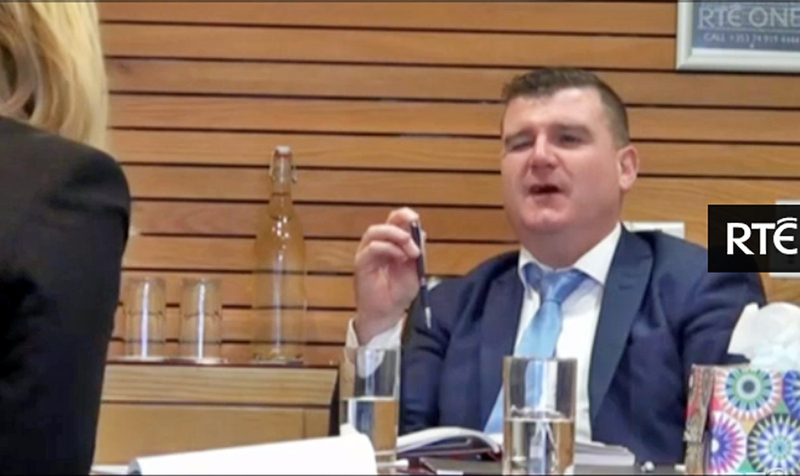 Independent councilor John O Donnell: will he do the right thing? But questionable dealings are nothing new in Donegal, as many local people have told me. Under the auspices of the former Fianna Fáil government, Liam Cunningham (Liam Ó Cuinneagáin), was paid substantial sums for his services as member and long-time chairperson of Údarás na Gaeltachta – more than a quarter of a million euro. Between 2002 to 2012, his travel expenses alone amounted to 131,730 euro. His fees amounted to 206,962 euro. More than that, documents requested by me under the Freedom of Information Act also now show that at least one company he established, Oideas Gael, received generous amounts of money – more than 350,000 euro in a series of payments – from the very same organization he chaired for so long. Mr. Cunningham said Oideas Gael was a hobby. With a financial return like that, that’s quite a hobby. In stock market terms, is this not a case of insider trading, and therefore unethical? After all, no better-placed person to access money from a group than the person who’s on the inside track of that very same group, knowing intimately its budgets, its strategy and its key staff. When called by me about this situation in a phone interview, Liam said, “Sean, things were different then. I don’t see it as a conflict of interest.” Different then? How is it different? The question was never answered. Liam Cunningham: is it wrong to lobby for money from the very funding organisation that you chair? Some readers might say, ‘Liam hosts Irish-language classes.’ That’s true, but so do many others and they don’t benefit from the rich financial backing Oideas Gael received so handily. Still others could do so – if they had that kind of money. Is such treatment fair and ethical? Is the playing ground a level one? How many times has Údarás said there’s not enough money for your project? The particular situation of Mr. Cunningham also raises an inevitable question: was it linked to an ongoing quid pro quo agreement among local Údarás board members then? And has anything changed since? Interested to find out? You have the right to know, and here’s how. (See below). Michael Heaney, formerly a director of services with Donegal County Council, has recently been appointed director of Enterprise & Investment with Údarás. Will his leadership change the way Údarás doles out money, how it selects projects to fund? Or will the same old cadre of elites be the recipients? Time will tell. As Údarás is helping DLDC select projects for funding under the EU’s upcoming LEADER programme, it will be operating under much tighter European regulations than the rather loose Irish ones it has been working under thus far. It will be interesting to monitor the quality of their project selection process for LEADER. You can find out additional information on the dealings of Údarás by e-mailing Judy Ní Dhubháin at judy(at)udaras.ie. Quoting the FOI Act 2014, you can ask for any information you like, financial or otherwise. The service is free. Be sure to tell me what you find out. I’d be curious to know.